I’m willing to bet that your goal in life isn’t to move to a homestead on 20+ acres of wooded land in southern Vermont by the time you’re 33 (although if it is, email me since clearly we have a lot in common). But I’m also willing to bet that you have a higher purpose guiding your financial decisions beyond merely slogging through life as a mindless consumer. Mr. Frugalwoods and I haven’t always known that our ultimate dream would be homesteading, but we’ve always believed that our money could do more than simply churn through the endless onslaught of “things” that our culture tells us comprise a life. Because as it turns out, the real stuff of life isn’t actually stuff at all. Our culture makes it ridiculously accessible to spend money and unsurprisingly, it’s the default mode for most folks. Conversely, not spending takes more effort but yields the benefit of putting you in a position of power. Instead of being ruled by your money, you’re fully in control of it. I, myself, prefer to be in charge of most things in my life (Mr. FW can attest to this… ) and so the thought of letting my money dictate what I can do is abhorrent. Yes, indeed, I’m the dictator of my money. It’s not a democracy around here. I firmly believe we’re all on our own unique journeys and I advocate the philosophy that there’s no one right way to execute your financial decisions or set your spending and saving targets. But there is no denying that frugality makes life easier. Full stop. Frugality will enable Mr. FW and I to reach financial independence by age 33. For quick reference, financial independence (commonly abbreviated as FI) means you have enough money saved that you can live indefinitely off the passive proceeds of those funds. For an average family earning a typical middle-class income, frugality is the most important component of becoming financially independent. Thus for Mr. FW and I, frugality and financial independence are intertwined and it’s hard to think about one without considering the other. If we made millions of dollars, we could be financially independent without frugality, but for us normal folks, you can’t have one without the other. When you don’t spend a lot of money–and are joyful about doing so–you don’t need a lot of money. And I think it’s important to note that financial independence takes many different forms for many different people–it in no way only means retiring early or quitting your job or moving to a homestead. You don’t have to have our precise goal in order to garner the benefits that frugality and financial independence will bring to bear in your life. Principally, and above all else, frugality grants us freedom. As interdependent human beings, we’ll always be beholden to someone or something else in our lives in one way or another–or, possibly, just to ourselves. The key is to have the discretion and freedom to choose who, or what, that’s going to be. The vast majority of folks are beholden to their employers. When you live paycheck-to-paycheck, or nearly so, there’s not much room for error as far as your job is concerned. You can’t quit, you might not be able to change professions, and you’re certainly terrified of being fired. That’s a type of dependency I never want to feel. If your spending and lifestyle ramps up to such a degree that you need your job in order to sustain your daily operations, then you’re in a tough spot and you’re going to have to keep working that job for the longterm–despite how you might feel. “But, I like my job!” And that’s awesome! I hear this refrain quite often and I’m genuinely happy for people who feel this way. But the concept of financial independence isn’t about whether or not you enjoy your job–it’s about how reliant upon it you are. It’s a wonderful thing to relish what you do each day, but, you don’t have to be beholden to it in order to enjoy it. After all, jobs are mercurial. Positions can be downsized, outsourced, re-organized, or otherwise evaporate. Frugality is the crucial difference between a job loss being a financial disaster or merely an inconvenience. Additionally, while you might love your job right now, are you certain you’ll love it in 10 years? In 20? In 40? That’s a long time to pin your aspirations on someone else’s willingness to fork over a paycheck. While you might always envision yourself working a traditional job, what if you decide you want to change career paths? Perhaps you’ve always wanted to work with underprivileged kids, but feel shackled to your corporate gig by your paycheck. Frugality gives you the option to seek a career that might be more personally fulfilling, but less monetarily lucrative. I’m quite familiar with this evolution in one’s career. When I started working ten years ago, I was convinced I’d found my ideal job and would happily work in the same field for my entire life. Mr. Frugalwoods felt exactly the same way about his profession. But, we both knew that being financially stable, and now financially independent, would grant us the flexibility to explore other parts of our personalities if we ever chose to do so. We’ve always had a higher purpose in mind for our money–even though we spent about eight years completely unsure of what that purpose was. Speaking from personal experience, there’s nothing more liberating than realizing you want to pursue an unusual dream and simultaneously realizing you’re able to afford it. Frugality and financial independence isn’t just about saving up a bunch of money and never needing to work again (à la me and Mr. FW), it’s also about making your living expenses match your values and hopes for the direction of your life. It’s about having the prerogative, if you so desire, to quit your job as a lawyer and work instead as a yoga teacher. If you’ve lived frugally it won’t matter that you’re only making, say, $20,000 a year as a yoga instructor. If your living expenses are low enough, you can grant yourself the freedom to make as little money as you want. Don’t let your spending prevent you from doing what you want with your life. Rather, let frugality sculpt the life you crave. Living way below our means for nearly a decade puts Mr. FW and me in the position to live a life outside the ordinary. Even when we were both making a pittance in our first post-college jobs, we still managed to save decent percentages of our earnings. To put real numbers to it: I made a whopping $10,000/year in my first job as an AmeriCorpVista in New York City and saved $2,000 of it. Our margin of savings has certainly increased commensurately with our earnings over the years–and we’re keenly cognizant of the privilege this connotes–but we’ve always lived the frugal life. While Mr. FW and I plan to quit the traditional workforce in favor of our frugal weirdo path of homesteading, writing, welding, AirBnB-ing, landlording, woodworking, and gardening, this dream is relatively new within our financial trajectory. We’re grateful every single day that we had the foresight not to spend ourselves into debt, or even into low savings, when this ambition was still unformed. After all, you don’t need to have an early retirement objective in order to reap the freedoms of frugality. Another fabulous gift of frugality is that Mr. FW and I never worry about our money. Frugality provides a buffer between our expenses and our savings that simply makes life more comfortable. Liberating ourselves from fear over being able to cover bills or manage an emergency is an uncommon thing in our “spend all the money now!” culture. 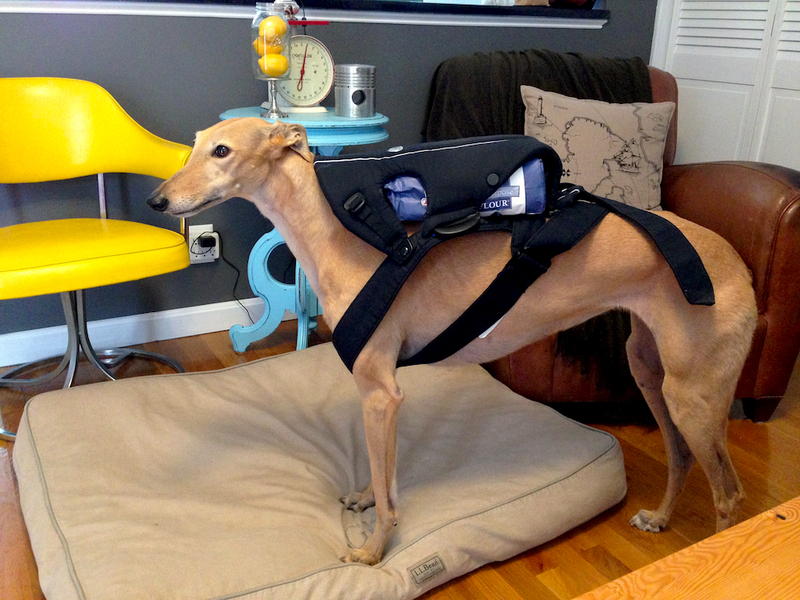 Frugal Hound testing out our hand-me-down baby carrier. Perfect fit. The mainstream media teaches us that our money is meant to be spent immediately and that we should constantly be on the lookout for ways to treat ourselves through spending. I subscribe to the opposite philosophy. I think money is meant to be saved and only meted out when it’s truly warranted and in service of our broader goals. Personally, I’d much rather have decades of living expenses stashed in the bank than a closet brimming with new clothes or a high-end nursery for Babywoods. Nope. 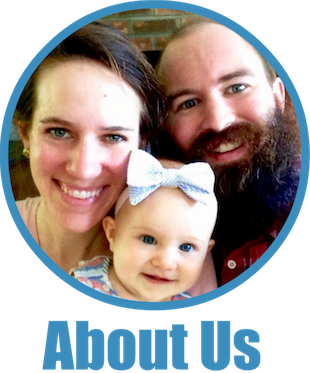 I’ll take the route of knowing we’ll be able to readily provide for our daughter’s actual needs over a $4,500 crib (yes, those do in fact exist–you’ll especially enjoy the one review of this crib, which I swear I didn’t write, but one of you might have). Thanks to our years of savings, Mr. FW and I are able to handle any emergencies that come our way. I don’t want to tempt fate here, but if we were to encounter a health crisis or some other radically unexpected expense, we’d be able to take care of it with our cash on hand. Having the luxury to not worry about money is practically unheard of–except among the super rich–which, rest assured, we’re decidedly not. And our frugality also liberates us from the more mundane aspects of money-worry, like budgeting. Since not spending is so ingrained in our personalities, we just coast on frugal autopilot and never fret over exactly how many pennies we’re spending at the grocery store. When your basic living expenses are extraordinarily low, and you’re living the debt-free frugal life, there’s a world of rewarding risk-taking open to you. Maybe you want to quit your job and travel the world for a year. Thanks to frugality, this could become a reality and not a pipe dream. Maybe you want to move across country to pursue your hope of becoming a country music star. Frugality, again, can make this a possibility. The ability to take risks extends beyond lifestyle choices and into financial opportunities. If you set yourself on firm financial footing, you have the capacity to deploy your capital in revenue-generating ways. Real estate is open to you as is investing or perhaps starting your own business. Money begets more money. Mr. FW and I started our married lives together seven years ago with no debt and not a single asset (not even a car) other than roughly $8,000 in a joint savings account. We then doggedly stockpiled our cash over the years and put ourselves in the position to become financially independent by 33. Yes, we’ve been extremely lucky in our careers and with our health, and yes, our privilege plays a key role in this. But the other thing that plays a role is our concerted frugality. Every bonus and every raise we received over the years was plowed straight into our savings and our investments. By avoiding risky spending behaviors early on in our lives, we’re now in a position to take extreme risks. We were, in fact, so risk-averse early on that we lived in a dank, one-bedroom basement apartment for over three years before finally moving above ground. We didn’t own a car, we didn’t spend much on entertainment, furniture, clothes, or the other trappings of success that our culture expected us to buy. Mr. FW and I have always had the sense that we wanted to do something unique with our lives. People often ask how our family and friends feel about our plans to retire early to a homestead in the woods and the honest answer is that they’re not surprised in the least. We’ve been frugal weirdos from the start. And we’ve always craved adventure. In retrospect, we could’ve saved even more if we’d been on board the extreme frugality train, but I’m grateful for the evolution we went through in our approach to our money. Financial independence wasn’t even a concept on our horizon when we were starting out our adult lives, but the idea of enabling ourselves to take risks and experience the world on our own terms always trumped immediate consumer spending. Mr. FW and I never wanted to rely on anyone else for our financial well-being. Not debt collectors, not our parents, and not our employers. Both the practice and the attendant results of frugality are different for everyone. But the common truth of living a frugal life is that you’ll always have options. Frugality is the difference between being forced to work a job because you’re entirely dependent upon every cent of your paycheck to having the freedom to explore a career you’re interested in, but that’ll perhaps pay less. Frugality is the ability for a family to have one parent stay at home with the kids. Frugality is the difference between an unexpected job less being a crisis or just merely an inconvenience. Frugality is the difference between a plumbing emergency in your basement being a financial devastation or simply a hot, wet mess (speaking from personal experience, it’ll definitely be a hot, wet mess). Your goal, most likely, is not to move to a homestead in the woods of southern Vermont by age 33, but I’m certain you have aspirations for your life. And while money doesn’t buy happiness, it does facilitate the ability to live the lives we want to live–not the lives we have to live. By living below our means, never skating too close to the line with our savings, and avoiding debt, Mr. FW and I created a life where we have a choice in how we spend our time, which is our most precious resource of all. My hope is that through frugality, you can discover this same freedom–though I imagine many of you already have. What freedoms has frugality enabled in your life? Embracing a frugal mindset has helped me gain a sense of financial independence at the age of 31. I work for myself, making a living as a blogger. How ridiculous is that?! I have a Masters, and taught university classes for 8 years before starting a blog on a whim. According to most people I’m not making a lot, but I make enough to live off of, and that’s enough for me. That’s awesome, Erica! It’s so rewarding to be able to do what you want with your life. Who cares what anyone else says! Frugality is equal to flexibility, a kind of flexibility that I look forward to in a few years. I would love the freedom and flexibility to pursue; it’s something that I wrote about today on my blog. Absolutely! Giving yourself that freedom to do what you want with your life is priceless. This is so unbelievably true, and I can speak from experience on the job loss thing! My first job out of university paid decent money for my degree and experience, but by no means was I well-off. I still managed to save 30% of my take-home pay towards a few different goals, an emergency fund being one of them. After about a year and a half in the role, there was a big round of layoffs, and I ended up being let go in a group firing (yes, those are apparently a real thing.) With four of us in the room getting fired at the same time, you could clearly see that this was much worse news for some of us rather than others. Thanks to my emergency fund, and my freelancing side hustle, I was the one who piped up with a *totally* inappropriate joke about heading to the pub across the street. Freedom: it means being able to make the inappropriate jokes sometimes, haha. Awesome post as usual, I couldn’t agree more! What does it say about me that freedom to make inappropriate jokes might be the most motivating argument I’ve heard regarding frugality yet?! Haha, huge yes to inappropriate jokes! Des–being able to laugh in a situation like that is the perfect example of the peace of mind that frugality brings. I’m sorry to hear you were laid off, but huge congrats to you for handling it like a frugal pro! Hi Des, that’s an awesome story, just wondering- what was/is your freelancing side hustle? Speaking from personal experience, there’s nothing more liberating than realizing you want to pursue an unusual dream and simultaneously realizing you’re able to afford it. I experienced this first hand this summer. An amazing opportunity came up to spend 8 weeks living in Paris and traveling around Europe. At first, it sounded too good to be true, but then I realized that by living frugally and saving as much as I could over the past few years, I had plenty of money to make this dream a reality. Even though I wasn’t saving in pursuit of this particular activity at the time, having that money saved gave me to ability to capitalize on the opportunity and the freedom to take time off from work (unpaid). I do think it is worth noting that frugality and saving can be hugely beneficial even at a smaller scale. Not is able to or interested in saving 50%+ of their yearly salary, and that’s OK. Every little bit you are able to save allows you just a bit more freedom. That’s wonderful, Ali! That sounds like a fabulous opportunity! And, how terrific that you had the financial freedom to do it! Also, I totally agree that frugality is beneficial at all levels. You don’t have to be pursuing financial independence for frugality to bring awesome things into your life. Thanks for sharing this story! First of all, that banana bread. Drool… Secondly, frugality really does open up the world to us, doesn’t it? Too often, people think of restrictions, but really, being purposeful with money affords us so many opportunities. Plus, the stuff that is often a by-product of consumerism is so constricting. Stuff takes up space, it takes up time, and it takes up money. So well said. I could never work in an “office cube” again on a strict schedule. I love having my freedom to schedule my own days. I also think frugality never requires a vacation! Not only is it expensive but if one is living on his/her own schedule pursuing passions, interests – that one week, splurge two week vacation is not necessary. I always feel for people who try to squeeze in all that “living” in one or two weeks a year. Ouch! Kathy, I hope to be in your shoes one day. The cube farm is no fun. I live happily in poverty Holly – or I should say frugality! Absolutely! Definitely makes life more enjoyable to do what you love every single day :). Amazing how money usually isn’t required for those pursuits either! Frugality does mean living responsibly and does make a difference in dealing with the surprises in life. I had the displeasure of being notified at the end of the day, my contracted position was no longer being funded. No notice was given. Thankfully I have no car loan, mortgage or debt. So with money saved and the unemployment check, I am able to cover expenses without worry about losing my home or not being able to pay the electric bill until my new job starts. I’m so sorry to hear your position ended. But, congrats to you for living the smart, frugal life and being able to handle it with minimal disruption. We just never know when these curveballs will come our way–you’re very smart to be prepared. I wish you all the best in navigating this transition. I wish you well with your homesteading dream. My wife and I homesteaded our little place in North Texas 33 years ago. We still have jobs, but they’re more by choice than by necessity. The flexibility of the frugal lifestyle is liberating, and my only regret is that we didn’t adopt it early in life, as you and Mr. FW did. Thank you so much! That’s wonderful you and your wife have enjoyed the freeing, frugal life! I think you two being frugal is the ultimate reason that has enabled you to reach financial independence even more so than privilege. We are planning a career change for Mr. Budgets next year, with lesser pay but more enjoyable, and frugality has enabled us to do this as well. Since we are already used to living on less there won’t be any stress when this move comes. That’s awesome! Glad to hear you two are able to make decisions about what you want in life–not what you have to do. That’s certainly a key advantage of frugality. Best of luck on the job change! I think about this every day. Why? I was laid off from my first job. I keep this layoff in my mind when I’m making financial decisions. Because saving money = saving time. Frugality also gave me the freedom to quit my unsustainable career as a concert promoter. By saving 40-50% of my income for several months, I was able to quit my job last August without a plan. I was able to re-charge by working part-time for 4 months before transitioning into tech. Frugality is everything. That is so fabulous, Kate. And such a perfect illustration of how much easier, and happier, frugality can make your life. Thank you for sharing this–I love stories like yours :)! Couldn’t agree more about the options aspect. Just why oh why did it take me so long to learn it. But, as you say, don’t judge, don’t look back. Learn and go forward. As an aside, if you’re ever looking to build in Vermont or elsewhere for that matter, look up Geobarns. George Abetti is a wonderful man who builds beautiful, sturdy homes, outbuildings, etc. His website is great and he works everywhere. He’s a Vermonter, and his structures are not typical suburban homes but more barn structures that work as homes or anything for that matter. Very Vermont-y! Thank you so much for the tip on building, Bev! Sounds like my kind of architecture–I’m a big fan of the “barn-like” appearance and structure. I just read the only review for that crib and died laughing! I was lucky enough to use my nieces crib and give it back to my brother afterwards. Free and stays in the family! Hahah, I found that review too hilarious–just had to share ;). Nicely done on the used crib! We’re using a hand-me-down crib for Babywoods too! It’s the way to be :). I’ve always thought that money buys freedom. In fact, money is The Root of Good in life. Not that it’s intrinsically valuable, but having it makes life way easier and opens up all sorts of options for you. Why more people DON’T try to save a significant part of their income baffles me. Do they really prefer a flashier house/car/whatever today instead of decades and decades of naming their own terms? The weird part of our world is why you and I are the frugal weirdos (that’s not trademarked is it?? 🙂 ) and everyone else is normal. Couldn’t agree more. We’re definitely the oddballs, which I’m totally fine with. We don’t want everyone to learn our secrets, right ;)?! I love how you break everything down into manageable pieces! While we definitely have different goals for our money (and I love that you don’t take a hard one-size fits all approach), your posts are the ones I refer to when I need a reminder that buying more stuff is actually hurting my goal of doing more with less. Even though it’s silly small stuff, each transaction would push me closer to the carousel of mindless spending that I’m trying to get away from. So I wanted to say thank you for sharing your journey and inspiring me to really assess what’s behind my urge to fork over my cash for a bag of candy. Thank you so much, J. I’m really glad to hear you found it helpful–that makes me so happy! And, I’m all about everyone having their own goals and direction in life. There’s definitely no one-size-fits all for finances (or anything else really) :). “Frugality gives you the option to seek a career that might be more personally fulfilling, but less monetarily lucrative.” – I like that you included this because I was discussing this topic with someone and she made it sound like not wanting to work is being lazy and unproductive…among other criticisms of the idea. But ultimately it is about give you options to live the life you want to live. Totally! It’s all about the options up in here! Frugality allows me the opportunity to spend time with my family and the people I value. Throughout college, it was always a stressful concept of whether I could attend a family member’s Birthday, or be there for a momentous occasion simply because I didn’t know if I had enough money for that tank of gas, or funds to buy that plane ticket. Being there for my loved ones is something I hold dearly to my heart, that now – when any of the following events occur I never have to think twice about whether I can be there, or not based on my financial situation. I view a lot of the money I save as money that I can utilize to be there for others – and frugality allows that freedom to be there for the people who I love! That’s wonderful, Alyssa. I really love how your frugality is enabling you to live as you want to. And, I can’t think of anything more important than being able to spend time with family. We’re the same way–we never think twice about spending money on a plane ticket to be with family or friends. So worth it :)! Frugality definitely gives you a ton of options in life and a lot of freedoms. I also believe it’s one piece of the puzzle (of many) to get me to FI! Just this morning, I was reading in the paper about an environmentally sustainable development project that is being considered locally. I found myself having a novel response to the concept: “That might be something we can invest in.” I NEVER used to think in this way. I might be interested in the practical application of a worthy ideal, but I felt removed from it by a lack of power. We’ve recently finished paying off all consumer and business debt – just a relatively modest mortgage to go. Frugality has made and is making a difference for us. Woohoo! That’s such a liberating and wonderful way to approach the world–love it. HUGE congrats on paying off all of your debt. That is beyond awesome. So happy for all the good things frugality is bringing to bear in your life! I took two months off unpaid between jobs this year and I should still manage to have a ~73% savings rate. That’s pretty good, if I do say so myself! It was amazing to have that time off work and to not worry about money at all while I wasn’t working. I may not have achieved complete financial freedom, but I can still take some periods of time off work if I so choose! I have a budget so that I don’t have to make the decision about X item or my investments with every purchase, which is a bit healthier for me. Wow, Leigh! 73% is awesome! That’s such a liberating thing to know you can weather time without a job with no worries. Congrats to you! That’s such a wonderful thing, Christina! Having that freedom and flexibility is the greatest gift we can give ourselves. Kudos to you for making that a reality. Frugality allowed us to purchase 17+ acre homestead in Southern Maine in our mid thirties. We have been here for just a year and wouldn’t trade this life for anything. Amazing!!! Sounds perfect. Congrats on living your dream! I love this-I need to reread about your start of your blog. A few months into embracing this life style choice-saving, stability, enjoying more sans spending more (at all), I’m not winning as often as I want to be! it feels such a lonely road sometimes, I’m glad bloggers share this much of their lives, thank you. Thank you for reading! And, that’s awesome you’re charting a frugal path! Fear not, there are plenty of us out there doing the same thing and we are all here to support you :). I don’t consider myself frugal, but definitely anti-consumerist, which has the same end result. A job is a lot more enjoyable when you work because you want to work, not because you have to work. I really wish employers gave more flexibility in the work schedule, because those who live simply don’t need a full time income, but may still want to work part time if they like their jobs and careers. I am FI with rental properties and side businesses, but I terribly miss some of the work I used to do in my previous career. I just don’t like someone else dictating 40+ hours of my week. Are there consultants used in your former industry? I’d love to go back to work in a consultation position one day but my old industry wasn’t like that, it was totally hands-on in the client’s facility engineering. Hard to do from home via laptop. Oh well, if worse comes to worse I’m sure not above flipping burgers. So true about working because you want to and not because you have to. The rigidity of most employers is a shame because I do think more people would be happy to craft a nontraditional schedule that would suit their interests better. I just met a new friend who works 2 days a week (because he’s already FI but enjoys his job) and that sounds like a great balance! Hey, I’m 33 and living my dream too on a 50 acre homestead 🙂 love the simple life ! Frugality will help me get out of debt and after that I’ll have much more money to do much more productive things with. I’m glad I discovered frugality, even if I’m not the absolute most frugal person there is. Have you ever read The Good Life. The goal to homestead in Vermont and maybe air BnB made me think of that book. Kind of a really good book. I love that frugality gives you options. I’m such a square though. I’m frugal, but I went the normal college route, career in engineering, kids later in life. My problem is that I want to work AND I want flexibility. And it’s SOOO darned hard to find that in my industry. I could afford to quit, but I don’t want to! Decisions decisions. My work is incredibly resistant to letting me return to part time, so I think I’m just going to be easing my way into working from home more. When I need to meet a plumber in the morning? Work from home till then. When it’s time to check my son’s 4th grade classroom tomorrow? (eek!) Leave work early, pick up the kids, go to the school, and do a little work from home later. When it’s time to hit the beach on Friday for the back to school get together? Leave early and maybe get a little work done on the weekend. They won’t let me work part time, but I don’t think I’ll get push back on working from home quite a bit. I love ‘The Good Life’! They definitely had a similar worldview/plan :). That’s too bad your employer won’t allow you to work part-time. I think a lot of people feel as you do and would love to have better balance in their lives between job and home. I hope the working-from-home strategy will work for you–that sounds like a good solution! 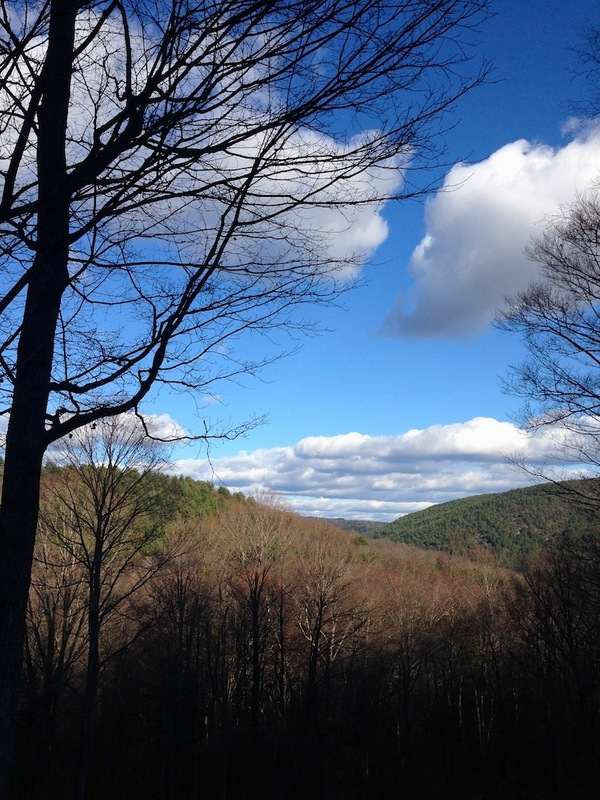 When you are searching for your Vermont wood lot, I suggest you also plan for the “apocalypse” by choosing a place with a sunny acre of good earth for a garden and even some water power possibilities. Whether it’s an economic meltdown or a solar flare that takes out all satellites & the electrical grid, planning for self-sufficiency for you and possible family from the cities can feel good even if the worst never happens. As with all things, always best to plan for the worst :). I was (very) unexpectedly laid off from my job 6 months ago. This could have been a real stressor- given unemployment benefits are less than 1/3 of my take home salary. My saving grace was that we have never lived as though we are a dual income household. We were fortunate enough to have paid off all school loans, mortgage, and have no car payment. Instead of this being a very stressful time, it has turned into an unexpected ” gift of time” for me. I was able to bank a chunk of my severance, as well as pay cash for some home improvements using my paid out vacation time. Right now I’m sitting on a beach as we did not have to cancel vacation plans due to my job loss. I’m very grateful. There are many things we’ve passed up over the years ( fancy cars, expensive clothes shopping, packing lunches) however I feel very happy, content, and pleased with the financial decisions we’ve made. Frugality means flexibility as well as security for us- and I’d choose that time and time again over a big screen tv or a BMW. That is wonderful, Kim. Your story is the perfect illustration of why frugality is the ultimate liberation. Makes me so happy to hear your lay off didn’t spell disaster for you and your family. Congrats to you for creating an awesome and financially secure life! Perhaps a bit off topic, but my… 19 or 20-year old Sunbeam stand mixer is about to keel. Is a Kitchen Aid all it’s rumored to be? I wouldn’t mind investing in one during a particularly good sale if I was sure I was going to get around 20 years out of it. On topic, frugality is allowing me to stay home and has for 12+ years. Of course now I’m totally obsolete in my field and not likely to be welcomed back in another 10 years when my youngest is up and out, so it’s frugal forever, LOL. Well I have to say that I have only had my Kitchen Aid for 2 years now, but I love it! I use it regularly as I bake A LOT and it has held up to all the work. I also know people who have had their Kitchen Aids much longer, and those mixers are still going strong. I would definitely recommend one! I also got the ice cream maker attachment for last Christmas, so now I can use it both as a mixer and an ice cream maker which is nice. I like that there is the option for using it for more than mixing (the attachments can be expensive though so I probably wouldn’t buy one for myself but I’ll happily take one as a gift haha). Of course, if you really only need it for mixing and there is a cheaper, still reliable option out there, then that’s something to consider. I love my Kitchen Aid too! We received it as a wedding gift 7+ years ago and it’s still going strong. We use it probably once a week and it hasn’t shown any signs of wear. They are expensive, but they seem to be worth it. My mother-in-law has been using her Kitchen Aid mixer for probably 15+ years and it’s still in great shape. I love the versatility of the different attachments too. Freedom to choose is my #1 reason for pursuing frugality or FI. $4500 dollar cribs! I did not know such a thing existed. I’m definitely the Craigslist type! Oh, that reminds me. Check out crib swings on pinterest. They are beyond cool. I so wish I hadn’t gotten rid of Baby Crackin’s crib before I discovered this! Hooray for the freedom to choose! That’s basically what life’s all about, when you think about it. Oh that crib just cracked me up! Fortunately we have a hand-me-down crib for Babywoods :). And I’ll have to check out crib swings… I’m intrigued. I’ll admit that sometimes I feel like I’m living paycheck to paycheck, but…and this is a huge but (hee hee), it’s because I’m about 60-70% working on my passion work, as opposed to living PTP and working for an employer and feeling like I have to because I’m out of control with my spending. Frugality lets me continue trying (sometimes as hard as I can) to keep pursuing this passion. If I wasn’t frugal, I would have to for sure look for a full time job and not be happy with the work I was doing for a long time. Yes! That’s a great illustration of the benefits of the frugal life! I think it’s awesome you’re able to do the work you want to do–not the work you have to do. Keeping rocking it, my friend! Thank you so much for posting so often- it helps me to stay on track with improving our frugality and paying down debt and trying to get ahead. I look forward to your posts! Continuing to learn each day and that contributes to the motivation to stay the course. Thank you so much for reading, Bethany :)! I’m so glad to hear my posts are helpful to you–that makes me incredibly happy. I love being able to share in this journey with all of you! Mrs. FW, I’m a big fan – I’d love to hear more about your plans for child raising! That’s wonderful, Clare! Way to go on creating the life you want! I just love how frugality enables these awesome things in people’s lives. And, I’m sure we’ll have plenty of baby-rearing stories once Babywoods is here ;). 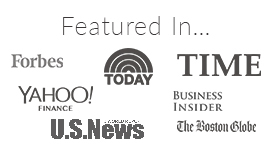 Thank you for reading and for sharing your story! I also have a goal of being a homesteader someday! Woo! Great minds! I’m quite a ways behind your timeline as a single parent with no child support funds…but I know I will get there. Travel! Travel travel travel!! People probably assume that I have a lot of money to be able to travel overseas so frequently, but the fact is that I spent less on two months all over Europe than a friend of mine spent on just one week in Italy. Frugality is key! Living in moderation (we aren’t quite the frugal gurus you guys are) will allow us to retire early in our 40s. We have a house that takes up single digit percentage of our income, we don’t feel the need to always upgrade (e.g. two used paid cars, one is that exciting as low fat vanilla yogurt 1998 Saturn), and we like frugal fun and vacations (like camping, hiking, etc.). This allows us to have a few more splurgey vacations too if appropriate. We probably go on a vacation every month at a minimum. Maybe my definition of vacation is different, but I cannot fathom those that say they haven’t been on a vacation in 5 years, etc. It’s so very important for us, but everyone is different. Living in moderation, we were also able to pay cash for a little camping trailer, which we could not be more excited for! We plan to live in it for long periods of time when we’re retired. Maybe sell or rent the house or find a whole new town. Not frugal upfront, but it’s part of the whole “living on less” game plan. That’s awesome, Shannon. Vacationing every month sounds like a fabulous quality of life to me! It’s amazing what you can make possible in your life when you don’t spend money on any and everything. Kudos to you for creating the life you want! I hope that The bull dying in today’s stock market didn’t hurt you too badly. I read the review on the crib. Pretty funny. Reminds me of the Hutzler banana slicer review. I am 75 years old and I was born frugal. That gives me the luxury today of being very charitable to those folks who need, food, water and shelter. But I still cannot get a haircut without a coupon! ???????? 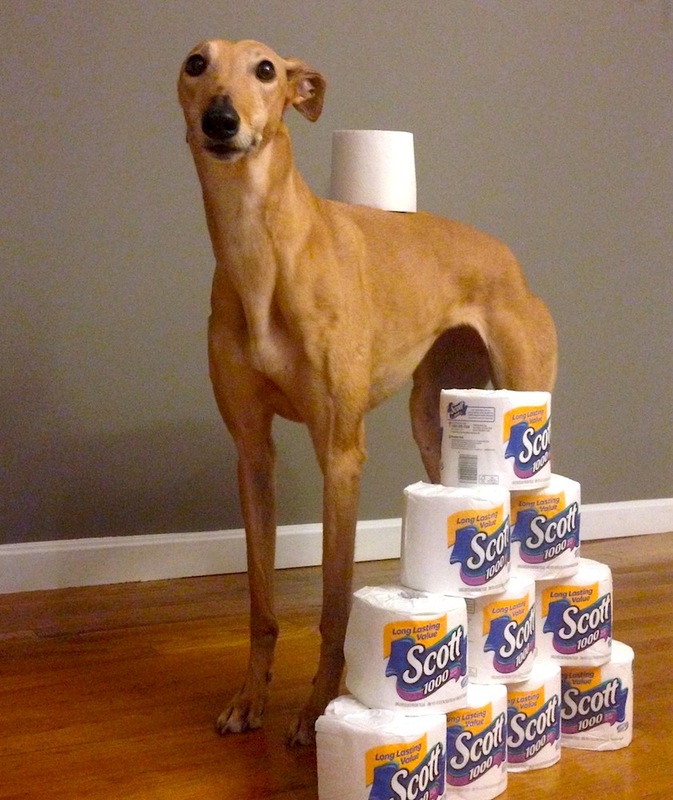 I just love frugal hound. What a very patient sweetheart dog. Because we have adopted more frugal lifestyle choices, I have had the option to pursue the dream of starting my own company. And I encourage all of my clients to adopt a more frugal way of life for this very reason. Even if you don’t have big goals or dreams, you may eventually have those and when they reveal themselves, you want to be able to take advantage of them and frugality gives you that option. Absolutely! Frugality really enables you to seize opportunities when they come your way. It just makes so much more possible. And I love that it enabled you to start the Financial Gym!! It means I can take a year off my job every 5-7 years or so and move someplace more expensive to work someplace new and different at half-pay or even no-pay. It means DH can quit his job and take his time finding a job that he likes more. It means we will never have to move into our parents’ basement in case of a catastrophic job loss. It means we can give away money to charities we care about. All such perfect illustrations of the amazing things frugality makes possible. I think that’s wonderful you’re able to take those risks and make the changes you want in your life. I am new to the frugal journey and am balancing being frugal with living in the now. We are doing a lot of traveling now. Part of the reason for this is related the possibility that I will inherit my mother’s arthritis. By 50, she could barely walk and needed her knees replace. By some miracle, the degeneration has stopped in her back. She spent nearly 5 years unable to function. I worry that if I save everything for later, then I may not get to go. You should know that you have inspired my husband (he is less enthusiastic about this but trying) and I to question everything and to take the 30 day challenges on products. We have just switched dog food to Kirkland. The ice cream challenge the cheaper one passed. So far the cheaper margarine is not making us happy. It sort of ruined our popcorn. We think we will try a different brand next time. We will get into our grove! Our goal is to create a real emergency fund (someone thinks a line of credit is the same) and to work on putting a lump sum on the mortgage (with a rate of 1.9%) every year. Slowly we will get there! That’s awesome, Kristen! Way to go on embracing the frugal life! And, I agree with you, it’s definitely important to balance frugality with enjoying the present. We live the luxuriously frugal life, which I think is the key to long-term frugal happiness. Congrats on taking the 30 day challenge and questing everything :)! You are on the right track, my friend! 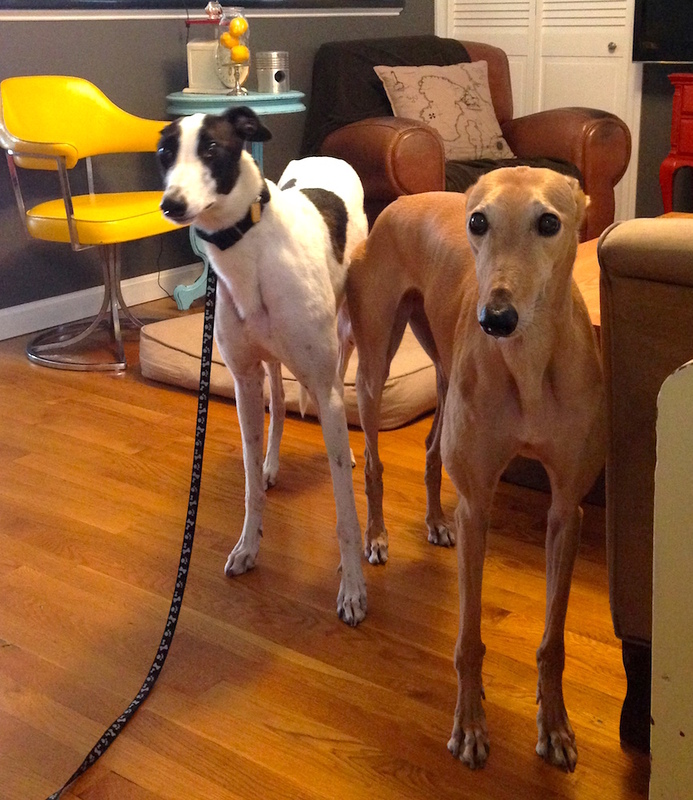 Frugal Hound is so incredibly patient with you two and your silly pics. That dog deserves a medal. 😉 Seriously, though, you are right on the mark. Frugality is worth every penny not spent. She really does deserve a medal! Top personal finance greyhound ;). Man, I feel like every post with baby stuff is me saying “acquire this/that.” But I really do want to add this. Try to see if you can find a moby (for the young ages — if you buy one for cheap on CL, you can sell it right back after 3-4 months) and an ergo. The Bjorn (I think that’s what you have) has no waist strap, so it’s hard to wear for a long period of time. The moby/ergo are completely on our top 5 list of baby products. You could likely hack something for a moby substitute (or borrow one), but the ergo (or a similar carrier with waist support) is pretty darn important if you want to go places where it is hard to take a stroller. 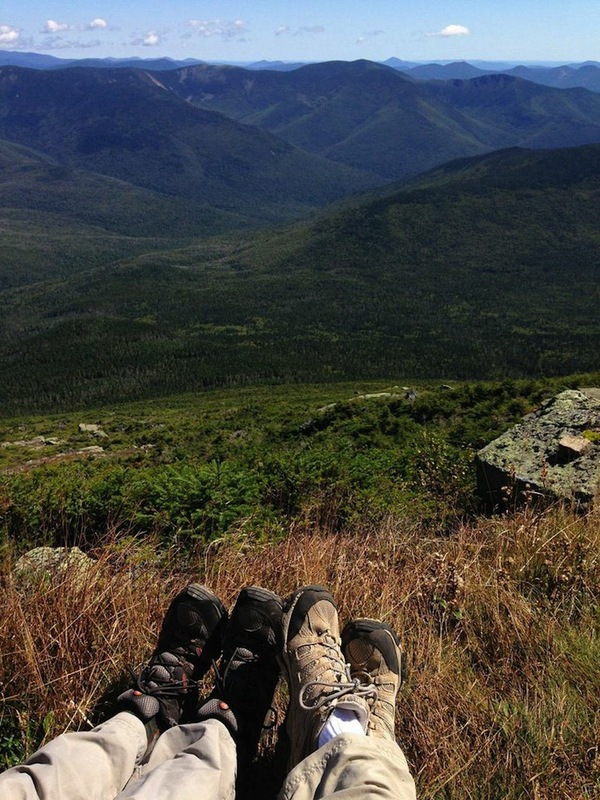 My husband and I hike, tho not quite as often/avidly as you. But we’ve done 3-5 miles in a day type hiking. The ergo is definitely comfortable enough to achieve that, but something without a waist strap likely wouldn’t be. We also have a hand-me-down Kelty pack that’s been awesome now that our little one is a year old. I totally agree with your premise here. I always say that money doesn’t buy happiness; money buys freedom. I have a love/hate relationship with my job and am trying to increase my savings regularly. I do still want to work somewhere, but I want the freedom to be able to say “f it” when I’m done with this job. And, honestly, I probably could do that right now, but I’m both not quite there AND not comfortable enough yet with what we have saved. But someday! Ooo, I actually have a hand-me-down Moby from my sister, which I tried out with the 5lb bag of flour and loved! I’ve heard great things about the Ergo, so I definitely have my eyes open for a free/cheap one of those. Thanks for the tips :)! And, having that freedom to quit if/when you want is so liberating. That’s awesome that you’re almost there! I love your posts and the slow and steady change they inspire. It’s a sense of freedom, and what I love the most about the delightful Mrs and Mr Frugalwood, they just don’t care what others think about it! Bravo. Tread your own path! Thank you so much, Karen! I really appreciate that :). I definitely think life is more enjoyable when you chart your own destiny! Thank you for reading, komal! And, I think you’re never too young to think about savings, so rock on! That’s wonderful that you’re in such a great financial place already. That will serve you and pay you dividends for your entire life :). Oh wow! That’s beyond awesome!!!!! I’m so excited to “meet” you!!! So true! My husband bought our house before we were married, with just his income. My parents keep calling it our “starter house” and his parents keep asking when we’ll buy a bigger one. But it’s just three of us (we have a four month old) in 1200 square feet and we were able to refinance to a 15 year mortgage with an even lower monthly payment. Now we’ve just gotten word that my husbands company is closing, and the fact that we didn’t scale up just because we could means we’re not sweating the job loss at all- we can live on one income for quite a while if needed. Thank goodness we didn’t listen to anyone else! Thank goodness indeed! You two are very smart to have resisted that urge to size up. It’s interesting how other people think we “need” more than we actually do. Congrats to you for making such an awesome choice! I’ve been thinking about you two a lot – I live in Boston as well! I have been thinking about how much money that I myself use that I shouldn’t and how I have so many things at home that I don’t use – such a waste. It is simply depressing thinking about it. I’ve been slowly packing things up to give to Goodwill – it’s hard to have the energy to do so after getting home from work, but I’m working on it! I was wondering what you think about buying a home vs. renting. Which one do you think is a better use of money? After reading your posts, I definitely think I’m going to get a place that is on the smaller side. I don’t want to fall in the trap of buying things to fill up space. I was also wondering what you guys do about medical expenses? What about health insurance? Have you budgeted for times of trouble? 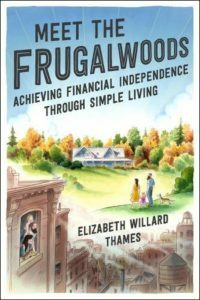 Are there any expenses that you and Mr. Frugalwoods disagree over, and how do you deal with that? I could see how being frugal together would be very difficult if you two had different ideals. Frugality was forced on us because we had a special needs child who really needed one parent home with him constantly. No regrets!!!!!!!!!!! He thrived and is doing great. Fast forward 30 years and with our mortgage paid off early, no car payments, with very little to spend our money beyond church giving, utilities, and food we are looking at how can we make our retirement pay for itself. Gardening and selling our surplus veggies in the front yard is more than paying for our veggie supplies for the year. Soon we hope to have chickens and since our vegetable stand customers have been asking we will be selling surplus eggs. When I bake, I bake extras and sell that second loaf of cinnamon bread to our customers. Yes I do have a waiting list of customers who want to know when I set out some bread. We have recently begun house sitting to help defray the most expensive cost of travel. Our goal is to use our extra time to pay for some of our daily expenses. We are exploring other ideas. Hang in there youngsters Frugality works!!!!!!!!! Living frugally really adds up. When I started tracking my net worth about a year ago, I barely had 70-80k of networth. I don’t make a lot of money but my wife and I try to save more than 60% of income every month. With that, I am about to double the net worth since tracking and it will always get accelerated down the road. I just wanted to say how much I love your website. You have inspired me so much. I think frugality is fun! I’m now to the point where I live comfortably, and even once I reach the point of not having to work, I’ll remain frugal. I believe frugality is required of a good steward. I also am loving your blog…..just found you about a week ago….love reading what all you guys are doing….you sure have energy to spare….but again you both are young…..I probably have missed a lot of what you’ve been doing, hope I catch up…..so looks like you have another day eh? What does your daughter do all day while you both work? She doesn’t look like she is old enough for school … So do you give out recipes ? 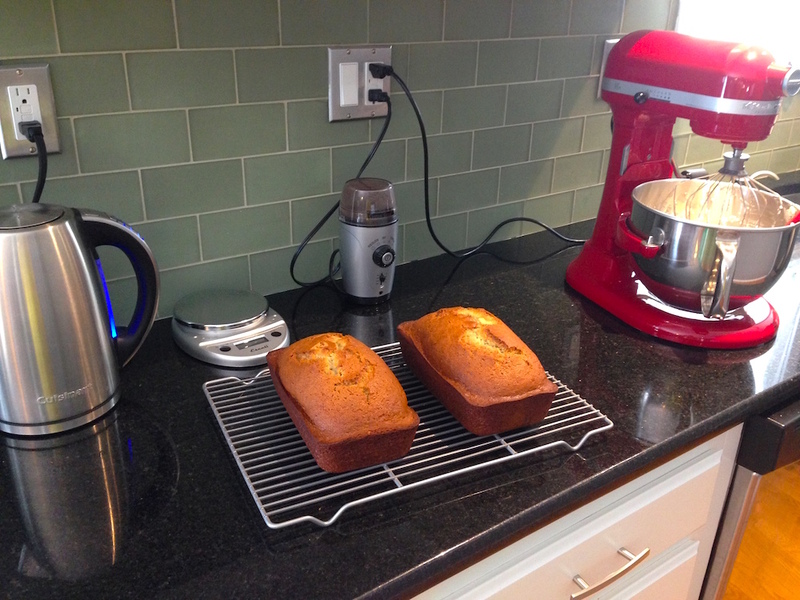 That bread sure looked good in your kitchen…..don’t care for banana nut bread, sure there is something else I can make ? Never made bread, but did find a recipe for no Knead bread the other day I want to try…..I’d love to have a bread machine, but figured I’d use it a time or two and it gets stored in the garage as I sure don’t have room for it inside…..I have very little cabinet space….been looking for another cabinet of some kind, but they are way too expensive….and I don’t just want open shelves…..looks too cluttered….I want everything behind doors and out of the way…..will keep looking I guess…..I did see #7 on here, but this one did not say what # it was…..so guess I will have to scroll back up and read it…..
Can you comment on economizing in a country like Greece – with its huge taxes snd no visible way out of it? We ‘re a family og three ( fathe 55 , mothet 49, daughter 6 years old struggling to make ends meet.